On the Sunday morning before Christmas, 1980, as I sat on the sands outside the temple of Sri Sathya Sai Baba in Puttaparthi a small tune came into my head. It was a lilting refrain, and it played itself over and over again, insistently, as if asking to be recognized. But I could not remember exactly what it was, nor what words went to it, although this seemed important. All I knew was that it came from somewhere in Handel’s “Messiah”. When I was younger I used to hear this work every year, then later I sang in the chorus on a few occasions. My singing teacher had given me two soprano arias from “Messiah” to practise. And in my own music classes, we often studied it. I had grown to appreciate the magnificent music more and more, but the full impact of the words had come upon me only a few weeks before Christmas,1980. Before, I had always assumed the entire “Messiah” was about Jesus. But one day six years after knowing about Sai Baba and three years after seeing Him for the first time, I began to wonder. The parts about Jesus were all in the past tense, and the parts about the Lord, for whom a new highway would have to be made in the wilderness, were in the present and the future. Not many days before, I myself had used a road that had only been in existence for a few years, to reach the courtyards of Sai. With me I had brought my musical score of Handel’s “Messiah”, rather the worse for wear, and it lay on my lap as I waited for Baba to come out. With it was a letter asking Baba to confirm my belief that a great deal of this oratorio is about Him, and also asking Him to bless a performance of it one day in His presence. I had begun to envision this grand event, complete with choir, soloists and orchestra under a certain world famous conductor. The idea seemed fantastic, but not unrealizable. I pictured people all over the world practising their parts, then gathering in Puttaparthi to put the finishing touches to the whole, all in the same spirit of love, service and devotion with which Handel wrote the music and Jennens found the words for ‘The Messiah’. Jennens could not understand himself why he had been impelled to begin selecting texts from the Bible, nor why he had selected those particular ones. An atmosphere of wonder surrounded the entire creation of “The Messiah”. 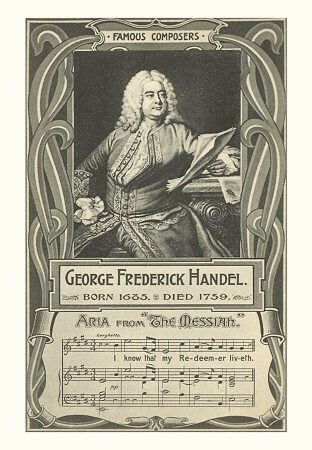 Handel was so inspired by the libretto that he composed the music in 23 days, hardly stopping to eat or sleep. A servant, tip toeing into his room one evening to take away an untouched supper tray, found him in a state of ecstasy. A glorious vision seemed to be still hovering before his inner gaze, and he said, “I did think I saw all heaven before me, and the Great God Himself.” He had, the legend says, just composed the “Hallelujah” chorus. Following its premiere for charity in Dublin, ‘The Messiah’ came to London for a royal command performance in a full theatre, before King George II. The first stirring notes of the “Hallelujah” chorus brought the King to his feet, followed by the entire audience. It is still traditional for audiences to rise for this particular chorus. Having originally composed this music for charity, Handel continued to use it in service of society throughout the rest of his life, giving benefit performances regularly for charities dear to his heart. In his will he left a copy of the musical score and several sets of words to the London Foundling Hospital. “Who is this King of Glory? Who is this King of Glory?” inquire the lower voices, those of the men. The music was over and Baba had now nearly completed His stately progress around the ladies’ courtyard. As He arrived at my place in the Darshan line, I held out the score and the letter, wondering what He would do. What He did was beautiful in its simplicity. He placed His hand firmly for a moment on the tattered pages full of the hopes of generations and the visions of prophets since Isaiah, and gave His blessing. How often do you get to ask Bhagawan some of the most intricate questions seeking clarification? Late Ms. Peggy Mason, an ardent devotee of Bhagawan from the United Kingdom had an opportunity to seek Divine clarification on some of the most intricate things about Jesus in a series of three consecutive interviews granted by the Lord. …and thus after 2000 years of his advent, humanity got to hear the Divine Whispers revealing the truth… Excerpts from Ms. Peggy Mason’s article The Interviews, published in Sanathana Sarathi, Sept 1980. I wished I had asked Swami more questions. Yet when one really thinks about it, many questions which leap to mind regarding past events are of academic interest compared to the here and now, and the living reality of the divine principle incarnate in Sai Baba at this most crucial period of the planet’s evolutionary history. There was, however, a question which was most vital to us – to hear from Swami’s own lips – and Ron “plucked up courage” to ask it. As long as I live I shall see His face as He gave this answer in a manner no ordinary human being could assume—so direct, so simple, so gentle, and completely egoless. For a few moments we said nothing, overcome by the impact of His reply. Everywhere men and women of goodwill are expecting and praying for the Second Coming of the Cosmic Christ spirit. But whether they recognise it or not, it is here amongst us in the embodiment of selfless love. The most touching darshan I have ever witnessed took place this Christmas Eve, in the late afternoon. Thousands of devotees from all over the world had gathered to spend Christmas with Bhagawan Baba. It had been threatening rain all day and by darshan time there was a steady drizzle. I gazed across the darshan line and saw a sea of people sitting in the rain. There was absolute silence; no one stirred. They all sat, soaking in the rain, as water dripped from their heads to their faces. Each one was determined to have Swami’s darshan. Their love seemed to touch the heart of Swami. He came out on the verandah, looking at all these apparently “God-Crazy” people sitting in the rain. 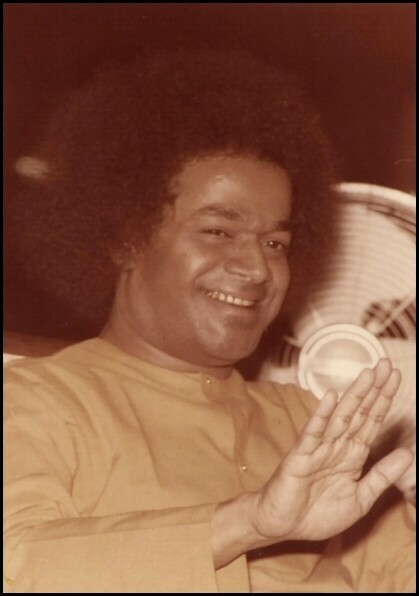 Bhagawan moved from beneath the sheltered verandah, walking ever so slowly in the rain, giving us darshan, and letting us know’ by His action that He is always experiencing every thing in life with us. Not once but twice He walked past – showing us that for each deed we do for Him, He blesses us twice. The wet crowd all dispersed after darshan, and re-appeared in clean clothing for bhajans. The rain had stopped in the interval. The Overseas Devotees’ Christmas Choir sat in front of the Mandir prepared to sing carols during the allotted Bhajan time. All the overseas devotees sat together next to the choir. Swami filled the verandah with all the boy students and placed His red chair amongst the children, at the western edge of the verandah facing the choir. It began to rain. The more it rained, the stronger the voice of the choir determined to go on with the programme. 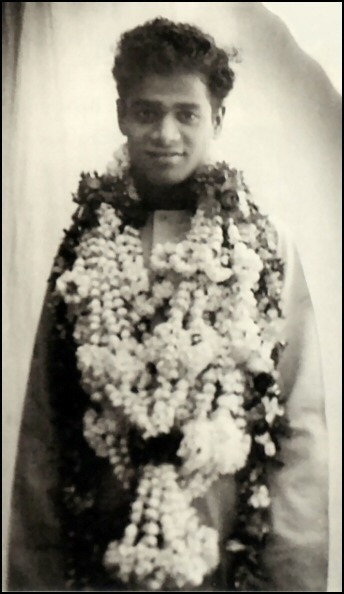 Swami swayed and tapped with His hands to the rhythm of the songs. He seemed to enjoy us all sitting in the rain at His Divine Lotus Feet.